In today's fast-paced, interconnected digital knowledge economy, the growth of companies is determined by their people rather than natural resources. Businesses that are best able to harness the innovation and creativity of their people are the businesses that will lead, thrive and succeed in this century. MARKETS: Emerging markets have a growing, affluent middle class which presents the single biggest growth opportunity for many companies around the world. CUSTOMERS: With the help of technology and abundance of choice, customers are becoming more and more sophisticated in their expectations and are demanding better personalisation of products and services. IDEAS: No-one will argue with the need for rapid innovation in any business. Digital technology, inter-connectivity and deregulation are rapidly changing the value proposition of businesses and the way we compete with each other. TALENT: It is not uncommon nowadays to find five different generations represented in the workplace. Add to this increasing levels of education, changes in migration flows and the more commonplace expectation of equality of opportunity and work/life balance, and you are looking at a more demanding and sophisticated employee populations. The answer to successfully addressing each of these mega-trends is the organisation's ability to draw out and capitalise on the diversity of its people. 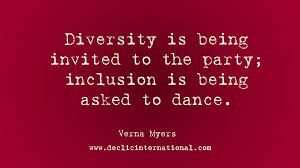 or Email info@voiceatthetable.com to find out how we can help you harness diversity of thought.